EMS has become the driving call type in many fire-rescue organizations. Many fire departments have entered the EMS business or are the first responders to medical calls at the very least. In most areas, citizens have come to recognize that a fire truck will arrive at their house if they call for an ambulance. This change has not always come easy to communities; there are either too few ambulances or the ambulances may be distributed throughout different locations. However, a tiered EMS system can ensure proper distribution of fire and EMS units, ensuring that they are in the right locations and of sufficient quantities. Important elements of a tiered EMS system include the proper placement of first response apparatus and the time segments involved in victim care. This will aid in the management of concurrent 911 calls, including the calls handled by mutual aid organizations and the calls that are stacked up and awaiting a unit's return to service. The use of a tiered EMS system takes the greatest advantage of the resources that are on duty in a fire-based EMS system or a separate fire and EMS system. Because the rate of fires has declined, municipalities cannot accurately predict and/or eliminate all fires, so keeping an on-duty fire force is necessary. Otherwise, the cost to the community for an unchecked fire could be the complete loss of business revenue or the blame of voting citizens for allowing unnecessary deaths. At no time in the future will fire engines ever disappear from cities, but the pure volume of fire calls does not facilitate a good investment. Ideally, fire companies should be strategically located within four minutes from an incident scene. Fire company personnel can then arrive quickly and treat victims at either the Basic Life Support or Advanced Life Support Level, depending on the certification level and equipment carried by each fire company. Ensuring the placement of current fire equipment and any future planned equipment in accordance with NFPA 1710 will help ensure a more timely response for both fire and EMS calls. Creating global imaging satellite (GIS) response polygons with tools such as ESRI’s Network Analyst will also aid in ensuring the proper placement of fire equipment and increase the efficiency of route driving. 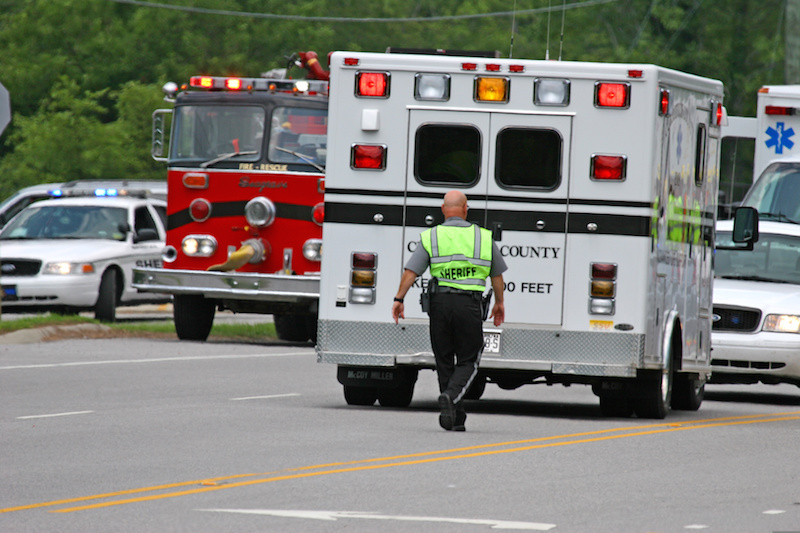 Time segments that are involved in the delivery of EMS care are stated in NFPA 450: Guide for Emergency Medical Services. Some of these time segments involve response time, scene time, transport time, at hospital time and return to service time. While fire companies have little to no control over some time segments, such as the travel time to an incident scene or to the hospital, there are time segments that EMS crews do control. For instance, there is the turnout time, which is the period between the initial notification until the ambulance departs to the scene. The at scene time and at hospital time segments are also within the control of the ambulance crew. Having a well-organized and efficient tiered EMS system will reduce the time spent by crews at an incident scene and allows faster definitive care. The reduction of time spent at the hospital also permits an EMS unit to return to its primary service area more quickly. Scene times lengthen when the desire to deliver more medical care at the scene is preferred to supplying care in the ambulance. Some medical directors, for instance, have requirements for the use of 12-lead EKG machines and the performance of other interventions prior to moving a patient. If these parameters are set, then both fire and EMS crews must understand the need to multi-task when they initially encounter the patient and must ensure that all requirements are met in a timely manner. If a fire company is capable of advanced life support (ALS), a fire engine crew can obtain the EKG and perform any other interventions while the ambulance is on its way to the incident scene. The use of reporting systems that allow the continuity of call information from fire engine crews to medic units is a way to speed up the scene time, because this information will then be available to the EMS crew upon their arrival. Time spent at the hospital is an issue in many communities. Some cities have an EMS supervisor assigned to the hospitals to ensure the proper and timely transfer of the patients. However, crews may sometimes have to wait for the hospital's nursing staff to take a report and ensure a transfer of the patient. This process is more efficient if a crew splits the duties of finishing the patient care report and cleaning up the ambulance. Also, using electronic reporting to transfer patient care records -- by either a fax machine or a computer -- can lessen the time spent at the hospital. This extra time spent at the hospital lowers the unit availability time and does not result in any gain in patient care. Overall, a tiered EMS system allows fire companies to function more quickly and efficiently. By paying greater attention to important EMS system elements such as equipment placement and time segments, the time saved could make a vital difference to patients' lives. next Do We Rely Too Much on Nonprofits for Recovery Efforts?